The Golden Gallop Kids Fun Run is also held on Sunday, September 22nd. This race is dedicated to our community of active youth, ages 2-10. This non-competitive, non-timed event is ALL about having fun and making it to the finish line! The Kid’s Fun Run course starts on Washington Avenue and ends through the official Golden Gallop finish arch! Runners must wait in the age appropriate staging area. 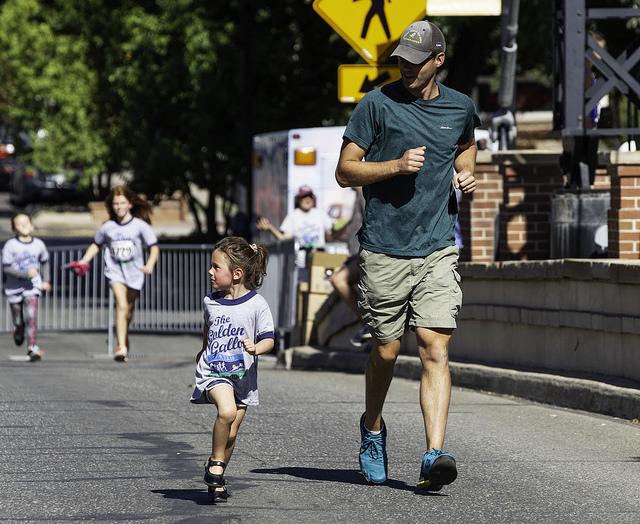 Buckaroos (Ages 2-4):The Buckaroos will start at 10:00am with a parent-friendly viewing course that starts/finishes along Washington Avenue (~1/4 mile). Ponies (Ages 5-7):The Ponies will start at 10:15am and they will run one loop around Clear Creek bike path (~1/2 mile). Stallions (Ages 8-10):The Stallions will start at 10:30am and they will run two loops around Clear Creek bike path (~1 mile). Register Today! The Kid’s Fun Run is $15 (until September 21nd) and $20 (on race day). Register Online or mail us a Registration Form.